This is serious business right here. For the Winter Sessions, we’ve got two of the heaviest of heavyweights coming to town: Diamond D, who is by far one of the best 45 spinners in the world (seriously, last time we had him out, he blew my mind), and 45 King, whose name speaks for itself. And these guys are gonna rock 45s for 3 full hours for y’all. That’s on top of goodness from your 45 Sessions residents. Don’t sleep! Cop presale tickets while you still can! I’m very excited to have the honor of remixing “Hard Work,” the lead single off my man Yameen’s new album. The OG version is a hip-house tune, but for my remix, I took it in a boom-bap direction because that’s just how I do. I got to have the song mixed by the great Matt Kelley (Hieroglyphics, Digital Underground, The Coup, etc. ), so I really dialed in on the sound that I want. I feel like this is the best joint I’ve done in a hot minute. Check it out! To get the entire single, head over to Yameen’s site for the OG version, my remix, instrumentals of both, and a bonus cut! I’ve been rocking little records at the 45 Sessions for years now, but oddly enough, I’ve never gone to the east, my brother, to the east to rock little records at Mobile Mondays, NYC’s premier all-45s party. Well, finally that situation is being rectified. Monday the 29th, it’s on! The 45 Sessions invades Mobile Mondays as DJ Platurn and I join Natasha Diggs and the MM crew to throw down. NY peoples, come party with us! 327 Bowery at Joey Ramone Pl. Got a nice new old tune for y’all! It’s my very own edit of First Choice’s disco classic “Love Thang,” gently remolded. I didn’t add anything to it (not my usual M.O., I know), but instead took things away and redid the arrangement to bring the funk out and emphasize the parts DJs know and love. You can cop it at my brand spanking new Bandcamp page–hope you dig it! Shout out to Bryan at TheBeeShine for doing this interview. Always fun to talk about inspiration and motivation! 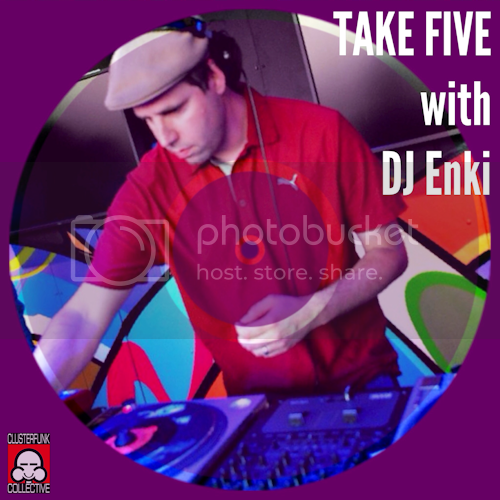 Shout out to the fine folks at Clusterfunk Collective for including me in their Take Five interview series. If you’ve ever wondered where I got my DJ name from, this interview covers that. It also covers my general DJing philosophy, the wonder of mixtapes, and, perhaps most importantly, what burrito to check for when you’re in New Orleans. You can read the whole interview right here. Friday, Dec. 20: The 45th 45 Session! Can you believe we’re already on the 45th installment of the 45 Sessions? Amazing but true. And what a great party it’s been–great crowds, great guests, great fun. So of course we’re gonna go big for #45 and bring in the capos of other 45s parties: Danny Holloway of LA’s Blazing 45s, and Natasha Diggs, the visionary behind NYC’s Mobile Mondays (and who you should also remember from the Valentine’s Day edition of the 45 Sessions last year). Gonna be big things with little records–you know we’ll turn it out right. So come celebrate with us on Friday the 20th! I’ve posted up a couple old remixes on Soundcloud for you to listen to, download, and love. First up is my remix of “All About the Music” by DJ Z-Trip featuring the legendary Whipper Whip that I did not too long after Z-Trip’s album dropped. It didn’t start out being a remix, but once I put the beat together, I started running vocals on top of it, and Whipper Whip’s worked pretty well, so I laid them down, added some scratches, and finished it off. 8 years later, I found it lurking on my hard drive and decided to post it up. Enjoy! And then there’s this remix of OutKast’s “Skew It on the Bar-B.” This one didn’t start off as a remix, either, but as a tribute to James Brown. I woke up on December 25, 2006, to the tragic news that James Brown had died. The only thing I could think to do was pay tribute to him the same way so many of my favorite hip-hop songs had: By chopping up some classic JB joints on the SP-1200. As I programmed this beat, I started rapping “old-school players to new-school fools” to it, so I grabbed the OutKast 12-inch, started running the acapella over the beat, and thought it fit really well, so this beat turned into a remix. New mixtape: Blendapella 2 is here! Back in 2006, the homie DJ Platurn and I put out Blendapella, a mixtape that was meant to showcase the craft of blending, which we worried was become a lost DJ skill. The mix was quite successful for us, and we kept talking about doing a sequel, but it took us several years to be able to actually get to work on it. Well, we finally did get to work on it, and even though it took us a full year to complete (damn, real life really gets in the way when you’re trying to coordinate schedules! ), we think it was worth the wait. In 2006, we made Blendapella as a reaction to the then-burgeoning concept of the “mash-up DJ.” Seven years later, DJing has moved even further in the direction of hype over ability. DJ-in-a-box has become not just real, but commonplace. New technology keeps pushing DJs further away from the craft of DJing, and it’s almost to the point that a DJ actually DJing live is the exception and not the rule. So we felt it was time to revisit the Blendapella concept and get back to basics. Every sound on this mix comes from original-pressing vinyl, and the blending was done live by DJs instead of in post-production by software. Enjoy! Blendapella 2 is only available as a stream for the moment, but we’ve posted it up at Bandcamp, where we’re asking a $7 download charge. This money will help us press up some physical copies (i.e. CDs), which we would really like to do. And thank you as always for your support! Without y’all, none of this stuff happens in the first place. So here’s what’s in store for the 45 Sessions this lovely Bay Area summer. All shows happen the third Friday of the month at the Legionnaire Saloon (2272 Telegraph at Grand in Oakland) starting at 10pm. And all shows promise to be a funky good time, so don’t miss out!